Hi, I am interested in your 2014 Honda CB1100 (stock #B1866 G) listed on Autotrader for $9,900. I'd like to get more information about this vehicle and confirm its availability. Circa 1969. Honda introduces its CB750 with its single-cam 4 cylinder engine. It was quick, it was modern, it was reliable and it was easy to ride. It remains on of the most popular and sought after retro bikes in existence today. Circa 2014. Honda introduces the CB 1100. Now, a house hold name in two wheel performance and synonymous in reliability, Honda introduces the CB1100 in full modern retro styling as a tribute to its classic CB line of cycles. The steel fenders, shape of the tank and Honda even engineered an all new air-cooled inline 4-cylinder engine to complete the package. The CB1100, its low, long and compact in appearance compared to todays bikes and Honda masterfully executes its modern retro styling as the cooling fins, tubular-steel frame members, round headlight and simple instrument cluster pulls it all together. The 2014 Honda CB1100 offered here is a one owner cycle and remains in AS New condition as it has only been driven just 252 miles since purchased new. 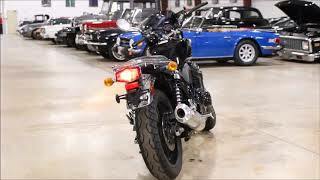 The bike features chrome fenders, chrome handlebars, mini faring with integrated retro headlight and Yoshimura exhaust. The bike has a great look with black paint, blacked out engine case and chrome and polished accents. Still new with just 252 miles. Factory exhaust and windscreen included with the sale.